Whether you're from Israel or visiting from abroad, whether you're hosting an elegant wedding or intimate dinner party, Mamilla Hotel, the newest of luxury hotels in Jerusalem, will create an extraordinary event that expresses your individuality and personal style. 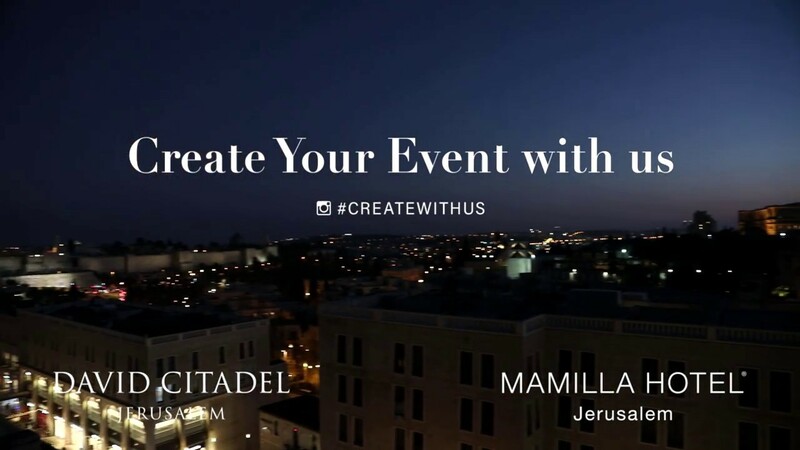 With its exclusive facilities, sumptuous catering and superb organizational expertise, Mamilla Hotel offers everything needed for the event of your dreams. From the elegant, 300 - seated Ballroom, with its distinctive contemporary décor and cutting-edge audio and video systems, to the original menus created by leading Israeli chefs, Mamilla Hotel is the perfect venue to add joy, elegance and character to a memorable celebration. Make your special day even more special by celebrating at Mamilla Hotel in the eternal city of Jerusalem. A wedding in Jerusalem is a meaningful event bound with great symbolism. The Mamilla Hotel offers you a chance to make a wedding in Jerusalem entwining classic style and unique atmosphere with unforgettable memories. The Mamilla Hotel Bar and Bat Mitzvahs are truly unforgettable. Combining excellent service with gourmet menus of the top Israeli chefs, Bar and Bat Mitzvahs can take place overlooking the walls of the Old City, or in a number of different elegant halls or restaurants. State-of-the-art sound systems enhance each celebration. A Brit, or circumcision ceremony, is customarily celebrated when a boy is eight days old. There is no more fitting or special location for a new beginning than overlooking the the Old City of Jerusalem's rich history. A Brit or Mesibat Bat (celebration of a new daughter) in the Mamilla Hotel promises to be an unforgettable event. Located in the heart of the city, Mamilla Hotel’s distinctive conference rooms provide excellent venues for meetings & corporate events. With its stylish and sophisticated interior, exclusively designed by Piero Lissoni, from networking cocktails to international conferences, the conference room is flexible to accommodate a variety of setups.